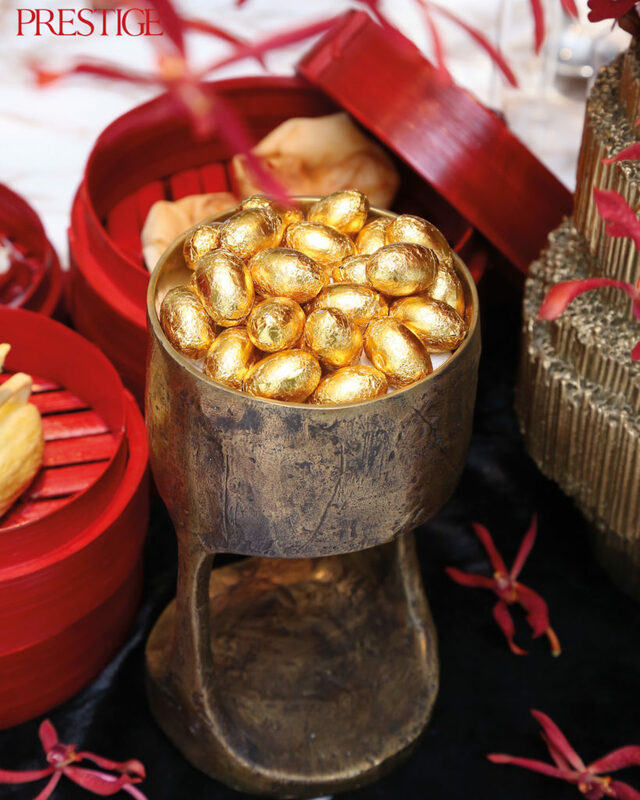 Prestige marks the Year of the Pig by inviting interior designer kezia karin to create a superb Chinese New Year table setting in collaboration with Prodotti Indonesia and Casa Domaine. It’s the Year of the Pig, the 12th of all zodiac animals and the symbol of wealth. Someone born in 1959, 1971, 1983, 1995, 2007 or 2019 is said to have a beautiful personality and to be blessed with good fortune in life. Men born in the Pig year are optimistic and gentle. They are very focused. Once they decide on a goal, they put everything into it. Women born in the Pig year are full of excitement. They attend social events whenever possible and treat everyone genuinely. Combined with their easygoing personality, they gain everyone’s trust. Prestige marked the Year of the Pig by inviting Kezia Karin, the Surabaya-based interior designer and founder of Kezia Karin Studio, to create a superb Chinese New Year table setting in collaboration with Prodotti Indonesia, an integrated luxury furniture retail network company, and Casa Domaine, a brand-new, seamlessly integrated, 1.2-hectare residential and commercial complex with two towers adjacent to Shangri-La Hotel and Shangri-La Residences. 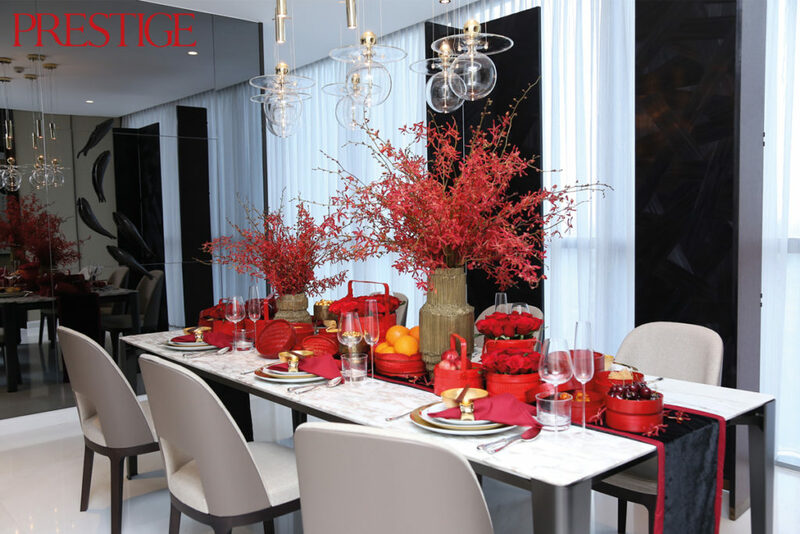 “Red colour is identified with Chinese New Year as it symbolises the energetic spirit like fire,” says Kezia, whose past projects include Padma Hotel Bandung, Corpus Equity Jakarta and Maystar Restaurant in Surabaya. 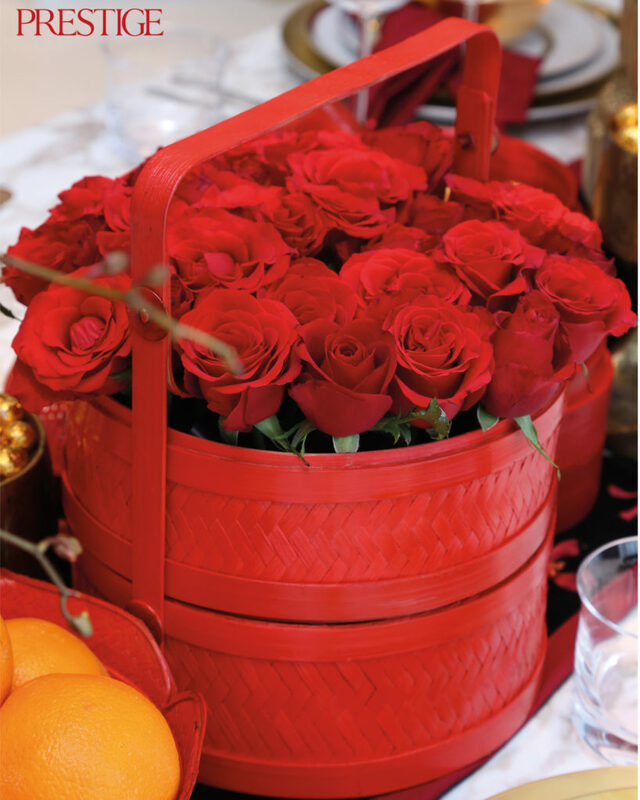 “People believe that red brings luck, happiness, vitality and fertility, as it also represents the spring season and the southern direction. New Year is a time when all the family gather and spend time together. It’s a time for reunions. Using a table and chairs from Flexform, a family business based in Brianza in Northern Italy that has worked with leading designers like Joe Colombo, Asnago-Vender, Cini Boeri, Rodolfo Bonetto and Antonio Citterio, Kezia created her setting in Casa Domaine’s magnificent showroom on Jl. Kh. Mas Mansyur. 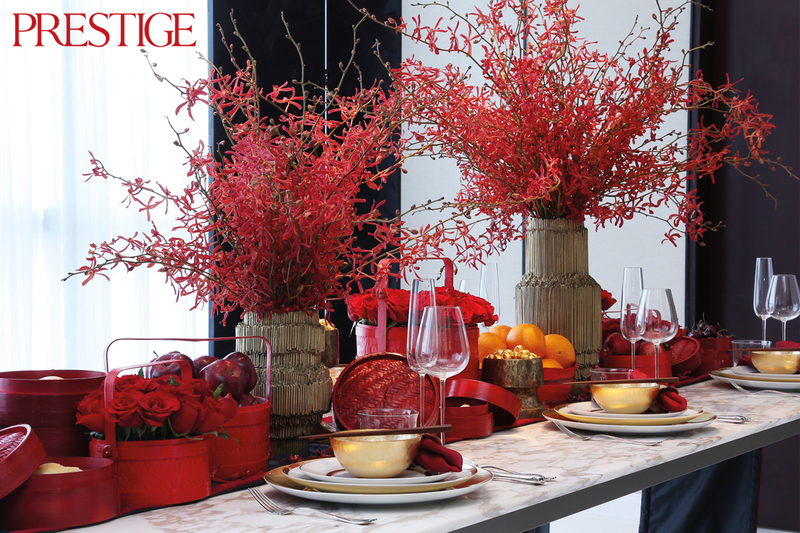 For her centrepiece, she chose a Paglia Vase by Alexander Lamont with Red James Story orchids. A Bangkok-based designer, Lamont created a set of three vases built of layered straw and cast in solid brass. The inspiration was the cut straw of the roofs of houses where he grew up. Thatchers would spend weeks up on the roof cutting, shuffling and stepping bundles of straw, until finally a beautiful golden roof was revealed. 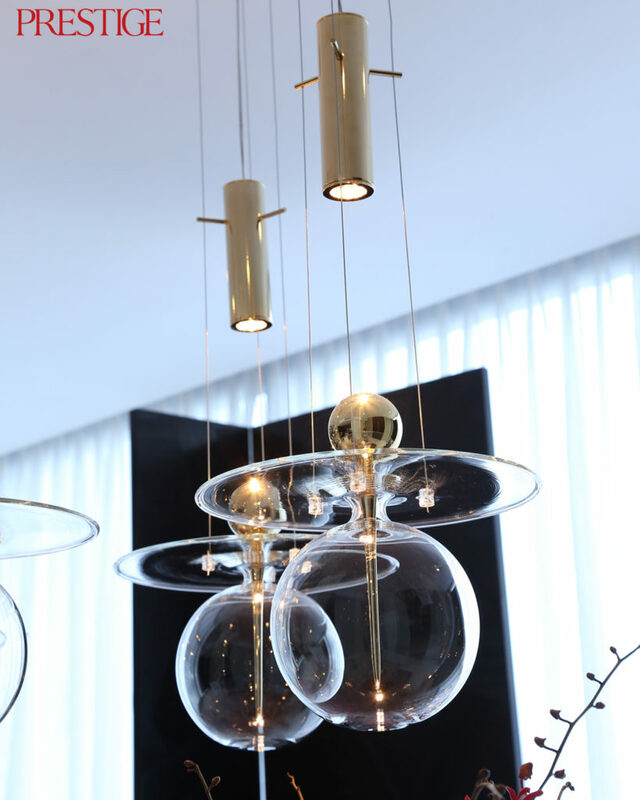 “I picked the vase because its gold colour represents the richness of nobility,” Kezia says. Among other highlights of the table setting were bronze textured Crucible Candleholders by Alexander Lamont (smooth reflective dishes hold naked flames within deeply textured bronze table sculptures) and Vista Alegre tableware and glassware, a century-old Portuguese brand whose designs are used in Europe on grand occasions.